Info "‘Wario’s recycle shop will take anything and give it new life! 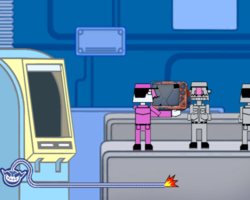 Unfortunately, we gotta do it all by hand!’"
Chop Shop is one of Tiny Wario's Microgames in WarioWare: Smooth Moves. The player must haul the object into the machine pretending to toss the Wii Remote to the side. When the object goes through it will become something totally different. 1st level difficulty: The object is a broken TV. The machine door is always open and the object becomes a flatscreen TV with Wario's nose and mustache. 2nd level difficulty: The object is a broken baseball bat and deflated soccer ball. The machine door opens and closes, and the object becomes a baseball bat with a soccer ball texture. 3rd level difficulty: The object is a faded photo. The machine door opens and closes rapidly, and the object becomes a family. This page was last edited on February 20, 2018, at 17:58.